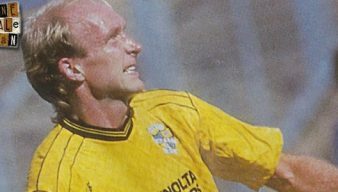 Ron Futcher was a veteran striker who played a key role in Port Vale’s successful 1989 promotion. He finished as second-top goalscorer with 19 goals. See a selection of five Port Vale goals that we rate among the best in the club’s recent history. 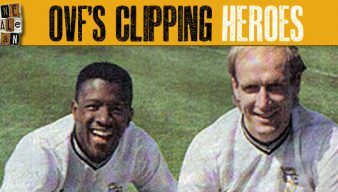 In our latest series of clipping from the OVF archives, we look at several matches from the latter part of the 1980’s. News reports, highlights (of both matches) and interviews as Port Vale defeat Bristol Rovers in the Third Division play-off final. Darren Beckford and Ron Futcher are amongst the goalscorers as we present two matches from the 1988-1989 promotion season. Our latest video feature is some footage of Vale fans and players celebrating promotion in 1989. Ron Futcher was an explosive mix of mood swings, supreme skill and bad haircuts. He is a worthy entrant to our Cult hall of fame. Oh Futch! Ron’s Back in Action! 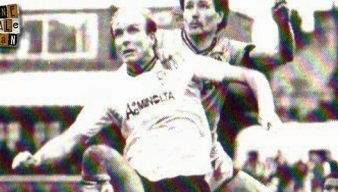 Football fans will get another chance to Valiant cult hero Ron Futcher in action, after the veteran forward was pencilled in to take part in a charity match.